Avocado Salad Recipe - the perfect diabetic diet food! An avocado salad recipe makes perfect sense on a site about how to have permanent fat loss. Yes, it has a lot of fat in it but if there is one thing I hope I can convey on this site, it’s how real food fats do NOT make you fat (unless you eat them with sugar!) You need to eat fats - they make food taste good and they help you to feel full. Fats are essential for our good health. Avocado is an important food for you for weight management and to control and reverse your diabetes. Avocado is the only fruit with fat content and it has a lot...30 grams for a whole avocado which is your daily requirement. That's what makes it such a great ingredient for salads. You only need 1/4 of an avocado at a time which is a serving’s worth. Avocados contain monounsaturated fats which help to control your blood sugar and diabetes. This salad which teams the avocado with a Mexican style dressing is great with chicken, fish, beans or a grain. It really adds so much flavor and richness to any meal. You’ll need to make your toasted sunflower seeds the night before you make the salad. You can buy your avocado hard and let it ripen at home on your kitchen counter. When I was going to college I was lucky enough to live in Santa Barbara and have a generous neighbor with many avocado trees. It seemed like an embarrassment of riches to be able to eat avocados so often. To open them cut it lengthwise, rotating the knife all the way around the seed. Then twist the halves in opposite directions to separate them. To remove the pit, slip the tip of of a spoon underneath and pry it up. You'll be preparing your seeds a couple of days before you're ready to make the salad. You're toasting enough seeds to use on other salads or for snacks. Dissolve salt in a large bowl of enough water to cover the seeds. Add sunflower seeds and optional cayenne and stir. Leave in a warm place over night. Drain in a colander and spread on a cookie sheet or put in a baking pan and place in a warm oven (150 degrees) over night or all day. Store in airtight container. When you’re ready to put your salad together, assemble all the ingredients. First make your dressing by putting all the ingredients in a small bowl and whisking briskly. Or you can put them in a mason jar and shake. Rinse the vegetables and put to one side. Put the greens in a salad spinner and spin. Then wrap them in a paper towel to finish drying. Put your leafy greens in a medium sized bowl. Cut the watercress in 3 inch lengths and add to the greens. Add the cucumbers and tomatoes. Slice the red onion and add it next. Toss the salad. Cut the avocado in two and slice each piece thinly across the top of the salad. Add about 2 tablespoons of salad dressing and toss thoroughly. Sprinkle 1/2 - 1 cup of the sunflower seeds on the top of the salad. It’s ready to serve. You’ll have sunflower seeds and salad dressing left over for other salads. If you wanted to make the avocado salad recipe your main course you can add 4 oz. of fish or chicken chopped into 1 inch pieces. Avocados actually help to reduce LDL cholesterol and protect arteries against oxidative damage. At the same time they increase the healthful high density lipoprotein HDL cholesterol. Avocados are sources of folate and potassium and they are very high in fiber. The oleic acid in avocados helps to control diabetes by controlling blood sugar and increasing insulin sensitivity. 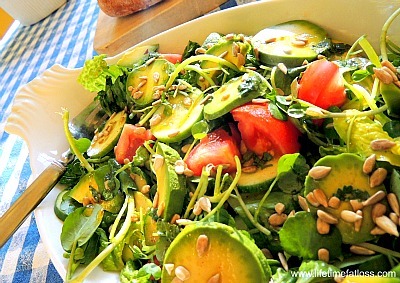 Return from Avocado Salad Recipe to Low Glycemic Recipes. Return from Avocado Salad Recipe to Lifetime Fat Loss home page.